Being a sucker for Land Rovers and off-road Adventure, Huw Williams didn’t take much convincing to join a new self-drive option in Egypt’s Western Desert. Driving off-road for 500km through the immense Saharan wilderness was child’s play compared to the first fifty getting clear of Cairo. Twenty million people live in Africa’s biggest city and the roads reflect this colossal density of humanity. Traffic pushes along its clogged arteries, at high speeds and low. Vehicles creep forward, inching through the hoard. Thick, sickly-sweet fumes reduce visibility with a dirty beige filter. When the flow eases and traffic moves faster, fear replaces frustration: lorries lumber across lanes, cars careen and weave erratically, often at murderous speed with only millimetres margin for error. Once, when impact seems certain, I involuntarily close my eyes, opening them to see the Pyramids in the distance, serene and surreal through the smog. Gradually the traffic thined, my hands relaxed their death grip on the wheel and suddenly it was just us on the open road, heading west towards Bahariya Oasis, flat gravel desert on both sides. My girlfriend Rosie and I are guinea-pigs for a new venture by Sand Rovers, a Cairene Land Rover owners club. They plan to offer people temporary membership, borrow one of their vehicles and join their expeditions, far out into the Sahara. 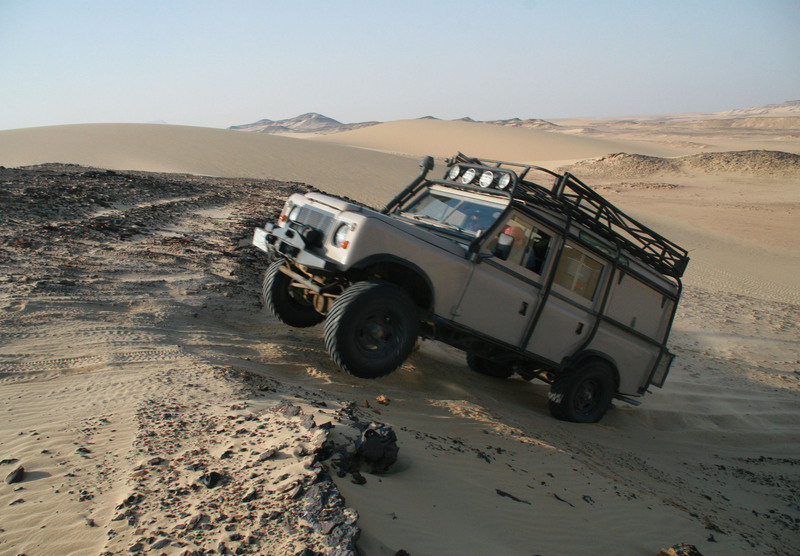 We loaned one of their trucks and headed out for a six-day adventure in a four Land Rover convoy. This is a unique way to see Egypt’s vast and varied desert scenery. There are travel operators offering multi-day 4×4 trips, but none allow you to drive their vehicles yourself. About a hundred miles before Bahariya, we slowed down, and in the middle of nowhere, left the tarmac, creeped down the banked verge, bumped across a railway line and gently accelerated over the desert, away from all signs of civilisation. From here we made our own tracks, following just our GPS. We headed south-southeast through the sand dunes, gravel plains and rock fields to the ruins of two Roman forts near Kharga Oasis. For over 300km we skirted the edge of the Ghard Abu Muharik dunes, a sea of classic ocean-roller-like sand dunes that flow through the Western Desert down to the Sudanese border. Here, at their eastern edge, they peter out into flat gravel lands that run towards the Nile. This makes the driving fun and safe. When the going gets too soft we veered right for a few hundred meters and onto a hard-packed surface. My off-road experience is fair, but not much of it in sand. Being in a convoy with three skilled desert drivers took away many of the risks this beautiful but potentially hazardous terrain holds. Driving the dunes’ rollercoaster curves is thrilling: adrenaline and awe in equal measures. Accelerating hard up their steep faces, backing off the throttle at the right moment to crest – but not become airborne. As the bonnet comes down to the horizontal, suddenly an undulating, golden landscape reveals itself, stretching to the horizon, pinned down by an immense sky dominated by Ra, the sun god: as omnipotent now as when the pyramids foundations were laid. Driving in sand, inevitably we got stuck. It is heart-sinking, realising that the sucking sand is winning and the truck is going to stop, axle deep, hundreds of miles from outside help. Yet all our extractions proved simple: when one truck foundered we all dug and pushed it free. In the worst cases, aluminium sand ladders were slid under the tires to provide grip. None of these forced stops were for long. The Sand Rovers are prepared for their extreme expeditions. The vehicles are loaded with fuel, water, food, camping equipment, first aid kits, spare parts, tools and a satellite phone, in case even their self-sufficiency skills fail. As well as being experienced drivers, two of the members with us, Sami Kangas and Darrell Hardman, are accomplished mechanics. But to be extra safe they brought along the club mechanic, Mohammed Copt, who quickly solved the few issues that arose. Hours at the wheel would be a drudge on road, but in the desert it is pure joy: music filling the cab, smiles permanently stuck to faces and eyes wide with excitment. Weaving through a landscape that changes so subtlety it’s only suddenly you realise that you are in a scene radically different from the last. But changes can also be acute. Cresting one dune we pulled up line abreast, mesmerised by a magical scene utterly different from the sandscape we had been through. Ahead lay a land of bone-white monoliths; rocks, boulders and domed hills all separated by channels of custard-coloured sands. The sand hardpacked, and the whole area a perfect playground for 4×4 driving. We couldn’t resist. For more than an hour we powered up, down and over the sweeping slopes, dips and crests: a waltzer-ride in the wilderness that we drive-danced around until lengthening shadows forced us, reluctantly, to prepare camp. Tucked into the tardis-like load space of the four Land Rovers was camping gear to make the nights exquisite affairs. An hour before each sunset, we pulled into the perfect spot, always somehow stunning even amidst all the surrounding beauty. Efficiently; tents pitched, a fire lit and the kitchen erected. Sue, Darrell’s wife is not only an unflappable off-road driver but also an amazing cook. She had prepared gourmet meals and brought them in a special overland-spec fridge-freezer. We dine on the likes of Thai green curry, lamb and Guinness stew, spicy turkey soup, an array of cheeses and salamis, and on one night, fois gras followed by handmade steak burgers stuffed with goats cheese, grilled over the campfire. That particular night eight Scotch malt whiskies emerged from the belly of a truck and we all sat around for a blind tasting session to determine the best. The alcohol probably helped, but it was impossible to believe we were sat deep in the Sahara. With flickering firelight and a full moon that set at midnight to reveal a sky bursting with stars, the nights were almost better than the days. “The Descent” was on our minds long before we reached its precipice. The others had mentioned it in passing, usually with the respectful tones of old campaigners discussing battles. I was nervous to say the least. The approach required crawling the vehicles over large rocks that the sand-laced desert winds had honed to intricate, razor sharp shapes. At the lip, staring out over the bonnet, there was nothing to see but the sky: the land fell away under the front wheels, cliff-like at first and then for a further three kilometres down a steep soft sand slope. I drove down as if I was carrying a load of nitro-glycerine: far slower than necessary, but the last thing I wanted to do was roll. The sense of elation and achievement on reaching the bottom tempered by the knowledge that I had been scared witless for most of the descent. We all opened a beer to celebrate. From here it was a short drive to the two Roman forts Labaka and Ain Umm Dabadib. Once part of a chain of garrisons that marked the southern outpost of the Byzantine Empire, the towering mud walled buildings have been incredibly well preserved by the desert sand and dry air. Standing sentinel against the sands they are an imposing sight: the only signs of human habitation we had seen for days, and they are two thousand years old. Their isolation shouts of the loneliness a posting here must have brought for an unfortunate Roman soldier. Despite their apparent isolation to us who had driven for days through the desert to reach them, they are now relatively accessible by an easier route. The main tarred road to Kharga Oasis is less than twenty kilometres from Labaka. When we reached it, suddenly civilisation and the modern world sliced back into our consciousness. For five days we had been the only living humans within hundreds of kilometres, surrounded by the great Sahara. From here was just the long drive north on roads that got slowly more crowded as we neared Cairo.